It's finished at last. For years my friends have asked me to record an album. Now I have! I have tried my very best to create the quality and ambiance of my musical repertoire heard at my performances. I have been playing Hawaiian music since 1939. My goal is to create, through my music, an avenue to share my love of the instrument with my friends. Encouraged by them, I decided to produce this recording and dedicate it to their long-term support. No, this isn't a new recording. However it's 1998 and people are asking for compact disks. Gather your senses of mind and soul and enjoy! This is a wonderfully relaxing CD. 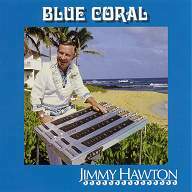 Jimmy's finesse stems from his lifelong love of the Hawaiian steel guitar and Hawaiian music. The accompaniment is traditional ukulele and bass, and Jimmy often double-tracks his steel to provide the sense of a steel guitar duet. Very pretty!